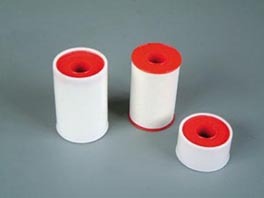 Adhesiver is made on the base of woven cotton fabric uniformly spread with a self-adhesive mass containing zinc oxide. It can readily adhere to the skin and yet be easily removed. Possessing the properties of perfect antisepsis, strong water-repellency.